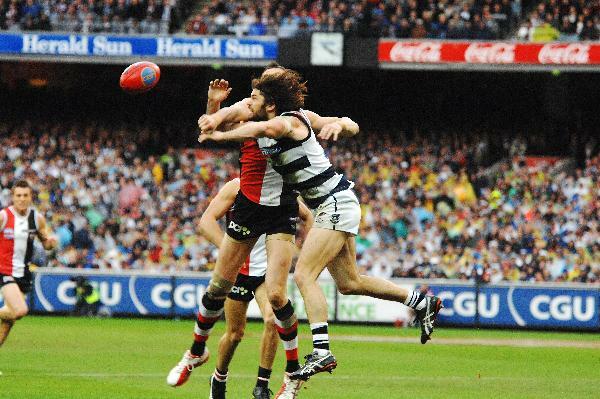 BIG CAT: Brad Ottens in the 2009 grand final against St Kilda. 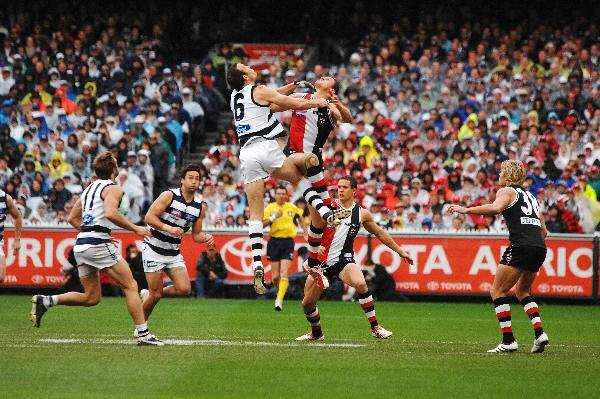 Two Geelong premiership stars will be inducted into the club’s Hall of Fame next month. Ruck/forward Brad Ottens and swingman Max Rooke will be honoured at an event at GMHBA Stadium on Friday 17 August. The club’s 17th legend will also be unveiled, three new life members will be announced and the announcement of the 2018 RJ Hickey award. Ottens played 116 games for Geelong after crossing from Richmond, where he played 129 games. Ottens played in three premierships for the Cats after being taken at number two in the draft by the Tigers in 1997. After debuting in round one 2005, Ottens became the 1000th player to play for Geelong. Rooke played 135 games and was a part of the 2007 and 2009 premierships. He was among the best on ground, garnering votes in the Norm Smith Medal. Rooke booted the first and last goals in the low-scoring affair as the Cats prevailed by 12 points in a classic contest. Geelong’s VFL side faces Sandringham on Sunday. The Cats enjoyed a 70-point win against Frankston last weekend and are third on the ladder, a game behind pacesetters Richmond and Casey. George Horlin-Smith, Lachie Henderson and Stewart Crameri (five goals) were among the listed players to put their names forward for future senior selection. Sandringham is 11th on the ladder with a 5-6 record and won’t be a pushover, although the Dragons were disappointing in a draw against the winless Coburg last week. Sunday’s game looms as a season definer. It’s a tough run home. The Cats face Casey (second) and Richmond (first) in their following two games and then face the highly competitive Essendon (fourth) before finishing with likely wooden spooners Coburg and Box Hill (fifth). Sunday’s game starts at 2pm at Trevor Barker Beach Oval, Sandringham. The VFLW team squares off against Southern Stars tomorrow. The Cats are coming off a 65-point hiding at the hands of a rampant Northern Territory Thunder in Darwin. Geelong was held goalless for the first half as the Thunder lapped up the hot conditions on their home deck in the Top End. The loss saw the Thunder leapfrog Geelong on the ladder into third spot. Richelle Cranston was in good form, booting a goal and again among the best players. The Southern Saints are also coming off a loss. Casey Demons proved too good by 11 points. Tomorrow’s game starts at 1pm at Deakin University, Waurn Ponds.